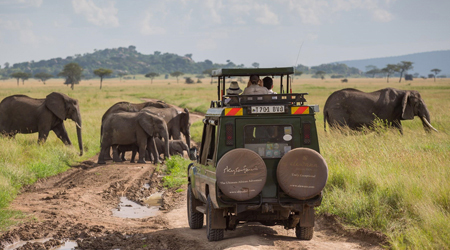 SkySafari Tanzania Classic includes all game drives, scenic highlights and offers all guests an unparalleled game viewing and cultural experience. ACT NOW! OFFER ENDS OCT 31ST 2019! The purchase of packages, air only or tours (hereinafter referred to as the “Travel Services”) offered by Tourcan Vacations constitutes a contractual agreement between Tourcan Vacations and the customer and implies your acceptance of Tourcan Vacations terms and conditions. Please ensure you read carefully and understand these terms and conditions prior to booking. Arrive at Kilimanjaro International Airport (JRO) where you will be welcomed by a Tourcan Vacations representative and chauffeured to The Arusha Coffee Lodge. Here you will enjoy a complimentary upgrade to one of our 12 Plantation Suites. Your stay at The Arusha Coffee Lodge is on an all-inclusive basis. After a leisurely breakfast enjoy a tour of The Burka Coffee Estate and then an alfresco lunch in the garden. After lunch you will be chauffeured to Arusha Airport to board the Executive Grand Caravan and fly to Kuro Airstrip in Tarangire National Park. At the airstrip, the Tarangire Treetops team will meet you for an afternoon game drive in Tarangire National Park after which you will enter through Treetops’ private reserve. Your stay here is for 2 nights in a Tree House, and is on an all-inclusive basis. After breakfast at Treetops you will enjoy a full day of activities including, game drives, a game-walk, visit to an authentic Masai village, sundowners atop Sunset Hill and a night game drive. Lunch and dinner will be served at Treetops. After breakfast you will enjoy a morning game drive through Tarangire National Park. Stop at leisure for a picnic lunch on your way to Kuro Airstrip and connect to Manyara Airstrip. On arrival, the team from lodge; The Manor at Ngorongoro will meet you and take you on a visit of an authentic African market in the township of Karatu. Arrive at The Manor in time for high-tea. Here, your 2 night stay will be in a cottage on an all-inclusive basis. After breakfast, our vehicle will take you on a full day of exploration of the Ngorongoro Crater. A picnic hamper lunch will be served on the crater floor. After lunch, you will explore more of the crater before heading back to the Manor for the evening cocktails and dinner. 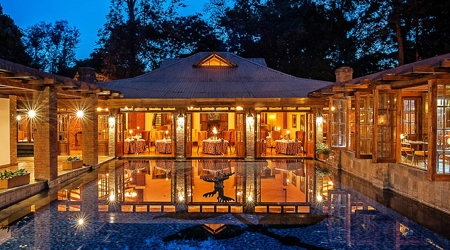 Today, you have the option of visiting the Lake Manyara National Park or staying at the lodge to explore the estate. Choose from a host of activities including horseback riding, cycling, an estate tour or a spa treatment (1 treatment per person) or, you may opt to just relax. After lunch you will be driven to the Manyara airstrip for your onward flight to the Serengeti, where upon arrival you will be met by the Migration Camp or Serengeti Pioneer team. The afternoon will be spent on a game drive with arrival at Serengeti Migration Camp or Serengeti Pioneer Camp in time for sundowners. You will spend the next 2 nights at Serengeti Migration Camp or Serengeti Pioneer Camp where your stay is in a luxurious safari tent, on an all-inclusive basis. After breakfast you will spend the full day exploring the vast Serengeti. Enjoy a Bush lunch, after which the afternoon will be spent game viewing. You will return to Serengeti Migration Camp in time for sundowners and dinner. Hot air ballooning over the vast Serengeti plains is the ultimate game viewing experience. Arrive at your launch site before dawn; take off as the sun rises over the hills. Your journey gives you a bird’s eye view of the wildlife as you look for leopard in the branches of an acacia tree. After your forty to sixty minute ride, you are met by the ground crew for the traditional “Champagne toast” followed by a magnificent breakfast, cooked and served on the Serengeti. Enjoy breakfast at leisure than explore the banks of the great Grumeti River on a guided game drive. Thereafter enjoy a leisurely lunch and transfer to the airstrip for you onward flight. 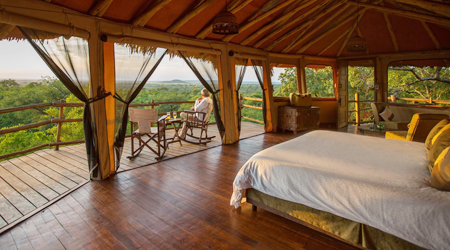 Interested in SAVE $100 on the SkySafari Tanzania Classic with Tourcan Vacations?